An interview with Kristen Finlay. Coffee, Music, Celebration, Tango, Ridiculous! Can you find love in a perfect cup of coffee? How about friendship? It’s more than just an addiction to Canada’s favourite coffee shop. Expect a little bit of everything – gospel, country, rap, beat poetry, and so much more in this new work. Through music and dance we bring you the characters that you will recognize from your local Tim’s. You might even recognize yourself! Come celebrate coffee, Canada, and community in this café musical! A musical about Tim Horton’s is so… Canadian! Where did the inspiration for Double Double: The Musical come from? Why write this story as a musical? Co-writer Anne Marie Szucs has a serious addiction to Tim Horton’s coffee… So that’s where we started. We also started writing it in Fort McMurray where the local Tim’s was certainly our meeting place – almost exactly halfway between our homes we would often meet there and it really felt like a core of our little community. As for the music, well, both of us were heavily involved in musical theatre. We’d actually met doing Guys & Dolls. One of the maxims of musical theatre is that when just plain old words won’t do it, you HAVE to sing. It felt right for what we wanted to say. It also gave us an opportunity to make the world so much more fun. There’s an additional layer to the comedy when you are doing a Rap, or a Tango, or even a wistful ballad. In your press release, you talk about ‘Tim’s culture’ – what is that to you? Tim’s feels inherently Canadian to us. If you’ve ever been to a Tim’s in another country it can feel like walking into a little patch of home. And in a smaller Canadian community, I think that it also becomes a bit of a community centre. There is always something very familiar about being in a Tim’s – even beyond the franchise. We (Canadians) can get possessive and opinionated about the place. 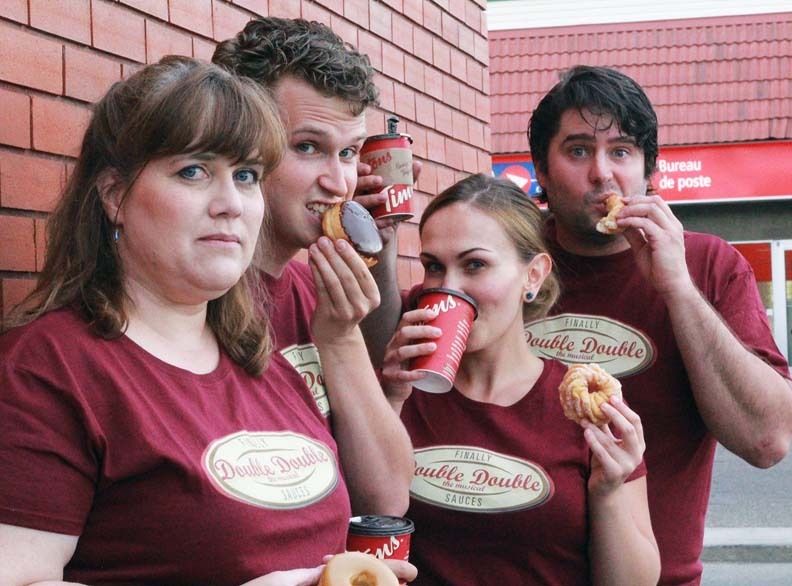 I imagine you’ve spent a lot of time in Tim Horton’s after working on Double Double: The Musical for 10 years. Can you share a favourite/quintessential moment – something you saw or experienced yourself – that manifests itself in the show? The song Just a Place is somewhat autobiographical for me. The first half is about a young mother who literally escapes her house with her toddler and infant to sit in Tim’s so she can get out of her house. Those were the early days of writing and we often had my then 3 year old and newborn with us. I know I tap into the feelings I had feeling somewhat trapped in my own home and needing a place to go with the kids where I could just be. It’s so much fun. We thought it would be funny, but we managed to assemble a cast and team that really knows how to lift it even more. It’s a bit of a whirlwind – you will not be bored! Oh, and there will be Timbits at our late night show! One of the reasons we are able to produce this now is because the right people/artists came into our lives. Matt Graham has done an amazing job with the Music Arrangement. Leah Paterson is choreographing. She did Letter and Words (Sterling nominated) at the Fringe last year and she has brought so much extra to the music numbers! And we have Arielle Balance doing music direction and she is simply wonderful! The cast, Owen Bishop, Justin Deveau, Nadine Veroba and myself (Kristen Finlay) are also having a terrific time onstage!